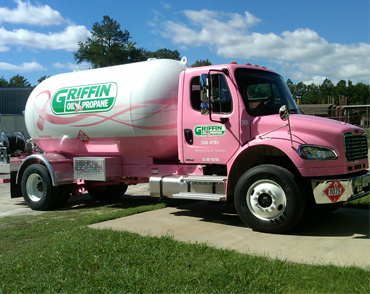 Propane / Agriculture | Griffin Oil and Propane | Suffok Energies, Inc. Almost 900,000 U.S. farms rely on propane to get the job done. Propane is depended upon to efficiently dry crops, irrigate crops and also harvest them; while the portability of propane allows it to be delivered anywhere. Locally, propane is used primarily for drying of peanuts, corn, soybeans, and wheat. Propane is also essential in the process of cotton ginning and heating of chicken houses. Griffin Oil & Propane is also experienced in servicing crop dryers to keep you running when you need it most.